Tag line: "Sorry Jack... Chucky's back!" Chucky, the evil doll that wreaked havoc in 1988’s Child’s Play, is back, and much like the first film, he’s the best thing about Child’s Play 2. As a result of their initial encounter with Chucky (voiced by Brad Dourif), Andy’s mom is deemed mentally unstable and placed in a psychiatric ward, while Andy himself (Alex Vincent) is sent to live in a foster home. Taken in by Phil Simpson (Gerrit Graham) and his wife Joanne (Jenny Agutter), Andy tries to lead a normal life. Unfortunately, Chucky, who was rebuilt by the Good Guy Doll Company, has other plans for the young boy, which includes stealing his soul. Aided by Kyle (Christine Elise), Phil and Joanne’s teenage foster child, Andy sets out to destroy Chucky once and for all, leading to a showdown that only one of them will survive. As the voice of Chucky, Brad Dourif again unleashes his evil side, making us laugh one minute (the scene where he’s posing as the Good Guy doll at Phil’s and Joanne’s house and momentarily forgets its name is “Tommy” is hilarious) and scream the next (he loses his temper more than once throughout the film, yet is at his most menacing in the grand finale, when he’s chasing Andy and Kyle through the doll factory). But as fine a job as Dourif does, the real masterminds behind Chucky are the men and women that brought him so convincingly to life, chief among them engineer Kevin Yagher, who not only matches the work he did in Child’s Play, but at times surpasses it (Chucky’s facial expressions alone will amaze you). 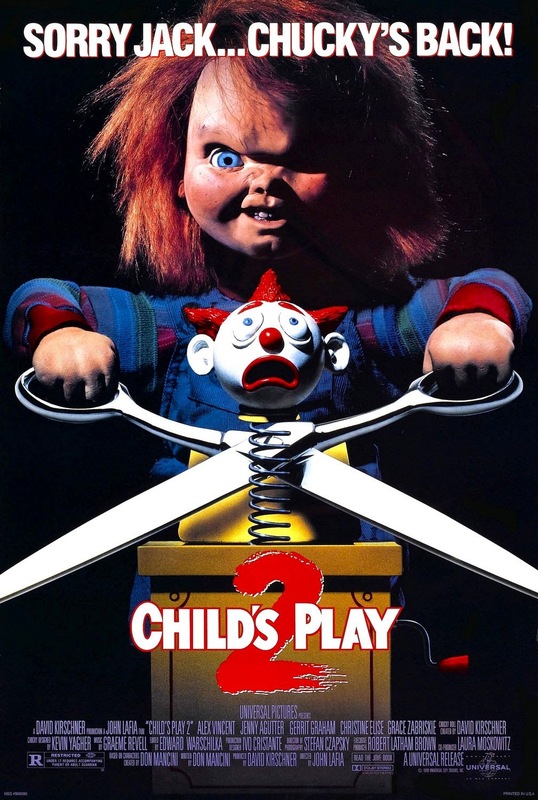 Chucky aside, Child’s Play 2 is a hit and miss affair. I was impressed with the film’s kill scenes (especially creepy is an early sequence involving a plastic bag), but the relationship between Andy and his foster parents never really develops (we never understand why Phil was so hostile towards Andy). Still, if you’re a fan of the original movie, odds are you’ll enjoy this sequel, if for no other reason than to see Chucky in action one more time.